The shelter is located in the Wadi Sura at the south-western foot of the Gilf Kebir Mountains in the remote south-western corner of Egypt’s New Valley Governorate near the border of Libya and Sudan. The area, abandoned in the present day, is one of the most arid locations of the Sahara. The shelter was discovered in 2002 by archaeologists Massimo and Jacopo Foggini and Ahmed Mestikawi. 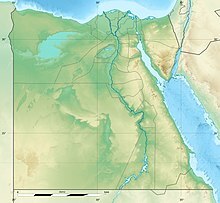 In 2010 scientists of the University of Cologne carried out an in-depth study of the shelter and called it Wadi Sura II to distinguish it from the Cave of Swimmers (Wadi Sura I) located some 10 km (6.2 mi) further east. The rock paintings were created more than 7000 years ago at the beginning of the Neolithic age. At that time the Sahara’s climate was humid. In the Holocene period there was a lake at the foot of the shelter. At the end of the Holocene climatic optimum 6000 years ago, the climate pattern changed to arid and the area was depopulated. The shelter is 17 m (56 ft) wide and almost 7 m (23 ft) high and contains over 5,000 well-preserved figures painted with red, yellow, white and black pigments. Hundreds of hand and foot stencil are over-painted with groups of human creatures and therianthropic and acephalic mythological creatures. Whereas the symbolism of the hand stencils can be found in many cave paintings all over the world, the beasts are unique. The shelter is upwardly topped off by rock engravings. In February 2016 a report in the Journal of Archaeological Science concluded that what had been considered to be human hand stencils "differ significantly in size, proportions and morphology from human hands" and were more likely made by humans using a reptile hand as a stencil. Many of the beasts were intentionally disfigured in prehistoric times. Always surrounded by human creatures, the beasts catch the eye due to their body size and shape: Long tailed, bull-like body, frequently three footed with human-like legs. Even headless they appear either to spit or to swallow human creatures. Some of the beasts seem to be wrapped in a kind of golden net. Furthermore, the shelter is covered with groups of dancing, floating or swimming human creatures. On the lower left edge of the shelter appear two groups of human creatures separated from each other by a rock crack. The ones above the rock crack are holding a sling over his head, while the ones below the crack have a hand above their heads and are all looking all to the left. Scattered throughout the shelter appear wild animals: An elephant, ostriches, gazelles, and giraffes. Along with the beasts the figures of the shelter represent a mythological world whose symbolism has not been deciphered yet. ^ J.-L. Le Quellec, P. + P. Flers: Du Sahara au Nil: ... Paris 2005, S. VI. ^ According to Linstädter/Kröpelin 2004 first the monsoon rainfalls withdrew to south and subsequently Mediterranean rainfalls disappeared leading to gradual desertification of the area. ^ Honoré, Emmanuelle; Rakza, Thameur; Senut, Brigitte; Deruelle, Philippe; Pouydebat, Emmanuelle (April 2016). "First identification of non-human stencil hands at Wadi Sūra II (Egypt): A morphometric study for new insights into rock art symbolism". Journal of Archaeological Science: Reports. 6: 242–247. doi:10.1016/j.jasrep.2016.02.014. ^ Drawing on archaeological finds in south-western Turkey, Lewis-Williams/Pearce 2005 concluded that the reference to a "sub-aquatic nether world" (in: Inside the Neolithic Mind: Consciousness, Cosmos, and the Realm of the Gods. London 2005, p. 111) and to theriocephalic figures (ibid. p. 115-115) are integral components of the iconography of the emerging Neolithic age. ^ Some scenes appear to be trivial immediately denied by the appearance of the beasts (J.-L. Le Quellec, P. + P. Flers: Du Sahara au Nil: ... Paris 2005, S. 90). Rudolph Kuper, Franziska Bartz (2013). "Africa praehistorica Bd. 26". Wadi Sura - the Cave of Beasts: a rock art site in the Gilf Kebir (SW Egypt). Köln: Heinrich-Barth-Institut. ISBN 978-3-927688-40-7. Jean-Loïc Le Quellec, Pauline et Philippe Flers: Du Sahara au Nil. Peintures et gravures d'avant les pharaons du Sahara au Nil. Soleb Fayard, Paris 2005, ISBN 2-213-62488-7. D. J. Lewis-Williams, D. G. Pearce: Inside the Neolithic Mind: Consciousness, Cosmos, and the Realm of the Gods. Thames & Hudson, London 2005, ISBN 978-0500051382. Jörg Linstädter, Stefan Kröpelin: Wadi Bakht revisited: Holocene climate change and prehistoric occupation in the Gilf Kebir region of the Eastern Sahara, SW Egypt. In: Geoarchaeology. December 2004, Bd. 19, Nr. 8, S. 753–778, doi:10.1002/gea.20023. Luc Watrin, Khaled Saad, Emmanuelle Honoré: The headless Beasts of Wadi Sura II Shelter (WG21) in the Western Gilf El Kebir: New data on Prehistoric Mythologies from the Egyptian Sahara. In: P. Kousoulis: Proceedings of the Tenth International Congress of Egyptologists, University of the Aegean, Rhodes, 22–29 May 2008. Peeters, Louvain 2011, ISBN 978-90-429-2550-2.